Marvel is stacking the deck with characters for Joss Whedon'sAvengers, and, while a handful have gotten a chance to shine in the spotlight—most recently, Thor, Captain America and Iron Man—one would think that if Avengers is a hit, some of those heroes might get their own movies. But one most definitely will not. "I mean, this was the third appearance of Hulk and everything that we had and were going for, we put in to Hulk's appearance in Avengers. So, I love that people are saying [positive things about the Hulk in Avengers] and are feeling that way about Hulk, but mission accomplished at this point." "It was a long road to get to this point. Although, I will say, after the [premiere] screening, I heard various arguments over who was their favorite. Which is my favorite thing: Arguing what was the favorite moment or character. And the fact that so many [people] are saying Hulk feels very, very good. Where we go next, we'll see. But we'll be very careful about it and deliberate—as we were in how we wanted to bring him back in Avengers." 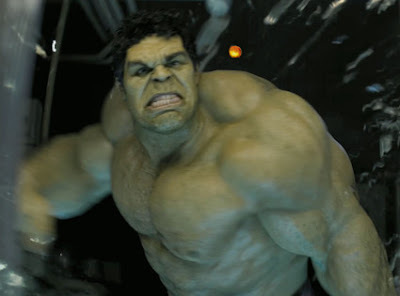 So, we'll see Big Green in Avengers 2 then, yes?